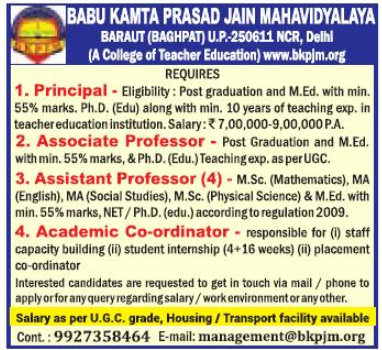 Babu Kamta Prasad Jain Mahavidyalaya, Baraut has advertised in Hindustan Times for the recruitment of Associate Professor/Assistant Professor jobs vacancies. Interested and eligible job aspirants are requested to apply by earliest . Check out further more details below. About College: Babu Kamta Prasad Jain Mahavidyalaya a Jain minority institution was established by Sh. Balraj Singh Jain to fulfill the dream of his Father late Babu Kamta Prasad Jain. He renounced his entire resource for the cause of teacher education and welfare of society. Late Dr. B.D. Jain guided the institute from its infant to rise up to its present state and Sh. Pradeep Jain, the secretary in the governing body. He established an institution of teacher education in the year 2004 with an enviable reputation for imparting teacher education with professional integrity and values of righteousness and enlightment.